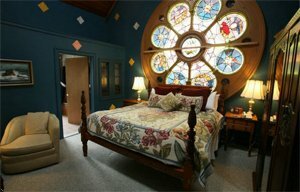 Unique Cape Cod Accomodations: Escape the Ordinary Lodging! Beyond the Ordinary Places to Stay! 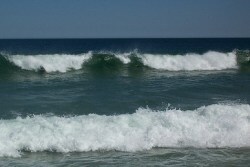 Would you like Cape Cod accommodations that'll be as memorable as your vacation? Look no farther! 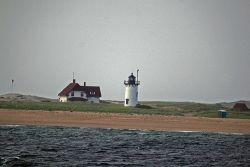 If it's unique lodgings you're after, let me show you a few of my top choices for distinctive places to stay on Cape Cod. To call the Belfry Inne a "heavenly" place, only begins to describe these unique accomodations! This lovely inn in Sandwich MA features a total of 22 guest rooms spread among three very non-traditional, adjacent properties - each with its own style and ambiance. The Village House - a restored 1882 Federal style home. The Inne has all the modern amenities you expect, and many more charming "extras" than you can imagine. Nicely sized rooms with vaulted ceilings and skylights, church-pew and four-poster beds, cozy in-room fireplaces, and waking in the morning to a rainbow of sunlight streaming through a stained glass window. Pretty special, I'd say! To top it all off, the two on-site restaurants serve delicious fare in very creative yet comfortable settings. In-season room rates range from around $150 per night to nearly $300 per night, depending on which building and which room you choose. Does your pup love to go for boat rides? Bring both of them with you - your dog and your boat! Green Harbor Waterfront Lodging in Falmouth is one of very few waterfront resorts I can think of with a private boat ramp and dock for their guests' use. Plus, Green Harbor is pet friendly. So there's no reason to leave any member of your family back home while you go on vacation. After a day on the water buzzing to nearby Martha's Vineyard or getting in some fantastic fishing on Nantucket Sound, Green Harbor's laid-back, friendly atmosphere is just the ticket. Their room rates and special offers are pretty darn enticing, too! FYI: Not bringing your own boat? Not a problem. Green Harbor has row boats and paddle boats for their guests to use (free) on the quiet waters of their Vineyard Sound inlet. So you won't have to remain land-bound, if you don't want to. Location, location, location is what makes the accomodations at Nauset Knoll Motor Lodge in Orleans so special. This property is part of the federally protected Cape Cod National Seashore. It's owned by the US government, but privately managed. With so few Atlantic Ocean-front lodgings to choose from on the National Seashore, this retro 1950s motor lodge is a real treasure! Occupancy is limited to 12 nicely sized, clean and comfortable rooms - each with a huge picture window looking out on the Ocean. Step out your door, walk across the lawn, and in no time you'll be standing on world-renowned Nauset Beach ... and likely munching on some of the best onion rings in the world at Liam's clam shack/snack bar on the beach. With room rates around $200 per night during peak season (yes, that's quite reasonable considering the very exclusive location! 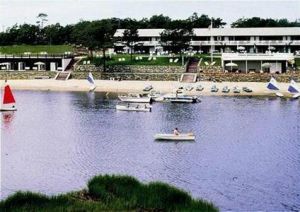 ), Nauset Knoll Motor Lodge is a don't miss - if you book early enough to get a reservation! Local lore has it that the historic Orleans Waterfront Inn has some spirits. And I'm not just talking about the cocktails served in the Inn's cozy, wood and brass-laden pub overlooking Town Cove. When I've been there, no glasses have mysteriously flown off the bar - and I've never seen the ghost of Hannah dancing naked in the foyer. Instead, what I have seen is a lovingly restored Victorian-style, waterfront mansion, originally built by Aaron Snow in the 1870s for his wife and family. Today, the mansion is a warm and welcoming 11-room inn with an on-site restaurant and Irish pub. The Orleans Waterfront Inn is open year round, and room rates include complementary breakfast ... plus the outside chance of meeting one or two of the Inn's long-ago residents. When it comes to unique places to stay on Cape Cod, Race Point Lighthouse in Provincetown has to be right at the top of the list! From the beginning of May to the middle of October, the keeper of the lighthouse welcomes guests for overnight stays at the fully restored 1840s-vintage "Keepers House" at Race Point Light. And the setting is about as remote as you'll find anywhere on the Cape - out amongst the dunes on the far northern tip of Cape Cod. Mornings exploring on the beach, and maybe seeing whales or dolphins splashing just offshore. Afternoons relaxing on the front porch with a cool drink and a good book. Watching the sun set from the top of the lighthouse. Then having dinner by the glow of antique gas lanterns. It doesn't get much better than staying at Race Point Lighthouse! Cape Cod Accomodations Photo Credits: My thanks to Laurien Nichols for the beautiful photo of Race Point Lighthouse! 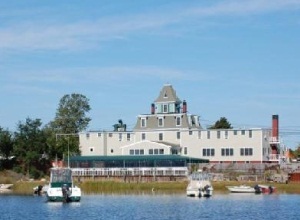 And to TripAdvisor for the photo of the Orleans Waterfront Inn.